Caloric properties are needed for many applications like process simulation or Equation of State development. 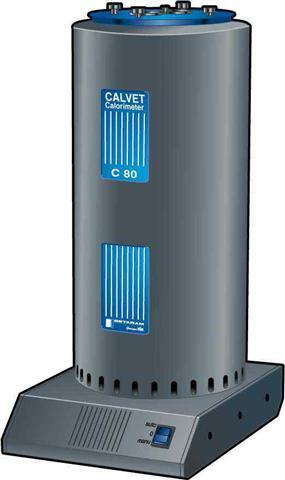 The C 80 calorimeter belongs to the Tian-Calvet calorimeters family distinguished by their accurate and reproducible calorimetric measurements. The C 80 calorimeter is a sturdy and high-performance instrument that makes possible a very large amount of applications in varied fields. The C 80 calorimeter is adapted to isothermal calorimetry, as well as mixing calorimetry and temperature scanning calorimetry. The instrument was designed to study materials transformation (fusion, glass transition, phase transition, polymerization, reaction, etc.) over the temperature range available (from 20°C up to 300°C), for studies on thermal stability, mixing, evaporation, gas-solid and gas-liquid reaction, under pressure reaction, for specific measurements of heat, thermal conductivity, etc. The main application at LTP is the measurement of liquid heat capacity as well as heat of vaporization and melting. 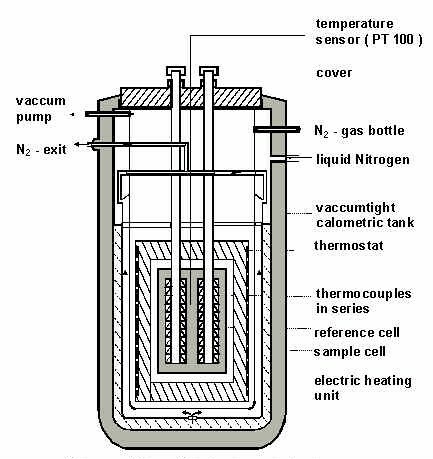 The main part of the C 80 calorimeter is the calorimetric chamber (see Figure). Various types of experimental cells can be introduced into the chamber, depending on the application to be performed. The fluxmeters are at the center of the instrument as well as the two experimental cells: the measurement and reference cells (see Figure of the internal view). · the calorimetric block which is the thermostat. · a Pt100 platinum probe to monitor the calorimetric sample temperature. · a Pt200 platinum probe to control temperature is also in the block. · a peripheral heating element. · a sleeve surrounding the thermostated block. · inside the sleeve, cooling air can circulate, pulsed by a fan. The calorimeter consists of two symmetrical thermal fluxmeters, each constructed by a series of 480 thermocouples surrounding a cylindrical hole for the measurement cells. The electric signal delivered by the difference in output voltage of the two fluxmeters is proportional to the thermal effect occurring in the cells. It is calibrated by using electrical heaters inside the cells. 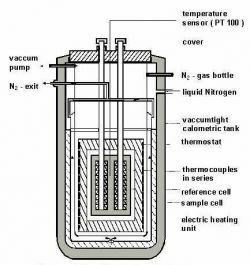 The temperature of the calorimeter (-190 to 200°C) can be regulated by using a cold nitrogen gas flow and electric heating. The calorimeter can be used for the measurement of enthalpies of mixing and solution, enthalpies of fusion and transition, enthalpies of reactions, enthalpies of adsorption and desorption and heat capacities. For each application suitable measurement cells are available. An isothermal flow calorimeter is used to measure enthalpies of mixing or reaction and absorption under isothermal (0 to 125°C) and isobaric (up to 150 bar) conditions. The principle of the measurement is to compensate the heat effects and to measure the required power. 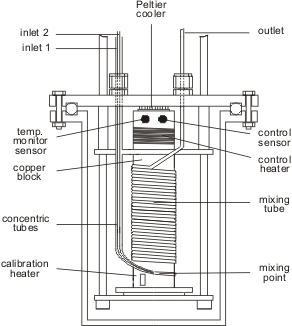 In this apparatus, two syringe pumps provide a flow of constant composition through a thermostatted calorimeter cell (see figure below) that is equipped with a pulsed heater and a Peltier cooler. The Peltier cooler is working at constant power causing a constant heat loss from the calorimeter cell, which is compensated by the pulsed heater. The required frequency is influenced by endo- or exothermal heat effects, so that the heats of mixing (reaction and absorption) can be determined from the observed frequency change between the base line and the actual measurement. A back-pressure regulator serves to keep the pressure at a level, at which evaporation and degassing effects can be prevented.